Bounce and Slide combos are perfect for any time of the year. Combos are a wet or dry bounce house. A water slide combo features a special non-slippery material for safe bouncing with water. Bounce and slide combos have many features. You can play basketball or climb and slide. In the summer just add a hose for cooling off. These combos are appropriate for children under 100 lbs. They feature a 15 by 15 jumping space as well as a separate sliding area. We carry a variety of different shapes and themes for you to choose from. The 4 in 1 combos can have a custom banner placed on the front to match any theme of your choice. 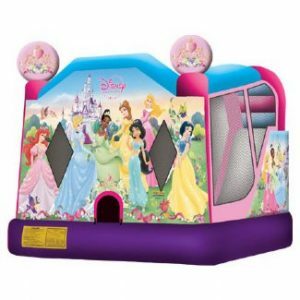 Some combos are theme specific such as our pirate ship, Disney Princess or fire truck.